Science tells us that grateful people are typically happier people. Being grateful makes us more optimistic and reduces negativity -- and that's a huge reason to make acts of gratitude a daily habit. Try to think about what you’re thankful for at least once a day. If you begin to prioritize gratitude and recognize the things you appreciate most, eventually it will become second nature. 1. Write in an abundance journal. Purchase a small notebook and keep it in your briefcase, purse or on your bedside table. Take a few minutes each day to jot down one or two positive experiences, or, alternatively, write down what you’re grateful for at the end of each week. Include small acts of kindness: a stranger who paid for your coffee, someone who held the door open for you or a phone call or note of appreciation from a friend, client or colleague. If you don’t write down these small moments of happiness, they will be easily forgotten. When you keep a journal, you can look back and remember how much you have to be thankful for during the times when life doesn't seem to be going your way. 2. Express your gratitude in person. 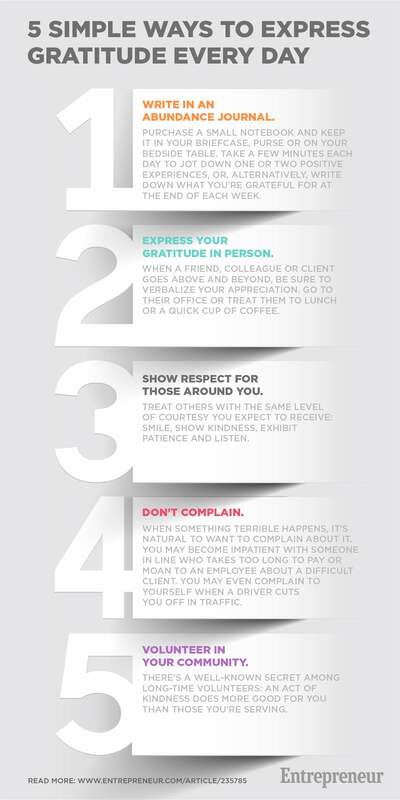 When a friend, colleague or client goes above and beyond, be sure to verbalize your appreciation. Go to their office or treat them to lunch or a quick cup of coffee. Many entrepreneurs find it difficult to leave the office, so make it a point to interact with others as much as possible. When you make time for those who are important to your business, the lasting impression that that leaves can be endlessly rewarding. 3. Show respect for those around you. Treat others with the same level of courtesy you expect to receive: smile, show kindness, exhibit patience and listen. For instance, the next time you make a coffee run in the morning, offer to bring back coffee for someone else in the office, too. Wash your coffee mug in the office kitchen rather than letting your dirty dishes sit in the sink. If you see someone running toward the elevator, hold the door. You know how nice it feels when someone takes a few moments to show kindness. Be that person to someone else. 4. Don't complain. When something terrible happens, it's natural to want to complain about it. You may become impatient with someone in line who takes too long to pay or moan to an employee about a difficult client. You may even complain to yourself when a driver cuts you off in traffic. But every time you complain, you reinforce a negative state of mind without offering a solution to the problem at hand. Instead, next time you feel frustrated, take a few deep breaths and try focusing on something positive. 5. Volunteer in your community. There’s a well-known secret among long-time volunteers: an act of kindness does more good for you than those you’re serving. Once a month, for example, I take my therapy dog, Cooper, to the local library where the children read stories to him. After all, dogs are non-judgmental and they make great listeners. If you’re short on time, choose a volunteer opportunity that requires only an hour or two each month. Volunteering gives you something positive to focus on and is a great way to give back to the community at large.